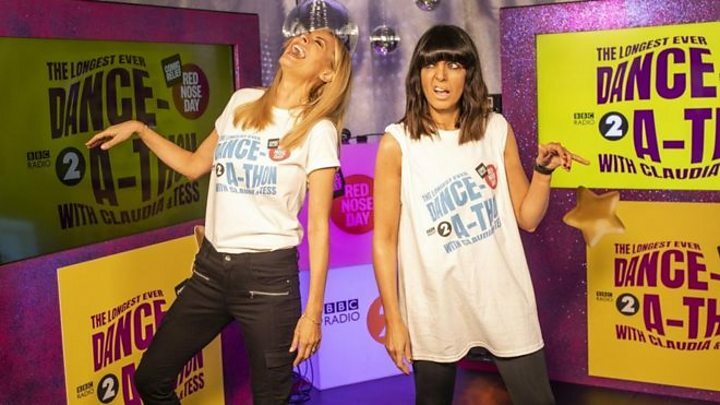 Tess Daly and Claudia Winkleman have completed their gruelling Comic Relief danceathon, after fighting through injury and sickness. The Strictly Come Dancing presenters raised more than £1m by dancing non-stop for 24 hours and five minutes. They ended their marathon challenge with a weary performance of Destiny’s Child’s Survivor, before collapsing to the floor. Daly, who suffered from motion sickness for six hours of the danceathon, said her co-presenter had been her lifeline. “She’s had my back the whole way through. We’ve looked after each other. We’ve seen each other strapped up with tape. We both had a little cry,” she said. Donations continued to roll in after the presenters put their feet up, with the total reaching £1,012,483 by Wednesday morning. The danceathon was broadcast live on BBC Radio 2 and the BBC red button, with fans following every fatigued dance step. “I’m not going to pretend it’s been easy, but I don’t want to moan about it” said Daly when BBC News caught up with the duo, 15 hours into the challenge. But while the duo sounded perky and energetic on air, they slumped in between links, taking hugs from colleagues and massaging their limbs without pausing their eternal shuffle. By 10:00 BST, Winkleman was slurring her words and Daly was feeling “very sick”. “We peaked a bit too soon, because we got really overexcited,” said the star. “I bounced for the first four hours,” added Winkleman, “and Trevor Nelson, who I literally love, came in and went: ‘FYI, you’ve peaked’. The presenters received celebrity support from their colleagues at Radio 2, singers Fleur East and Beverly Knight, and the casts of the West End musicals Hair and Everybody’s Talking About Jamie. Great British Bake Off winner Candice Brown and former judge Mary Berry also turned up at BBC Wogan House with sugary snacks to keep the stars on their toes. Meanwhile Jeremy Vine and Rylan Clark-Neal engaged in a dance-off to Sylvester’s disco classic You Make Me Feel (Mighty Real) that quickly went viral online. This feat of endurance was all in aid of Comic Relief, ahead of Friday’s Red Nose Day fundraiser. Next articleCelebrity Fitness: Gwyneth Paltrow’s Goop: Is it changing lives or selling ‘magical thinking’? Either way, it’s cashing in.